Pierson/Plymouth - 6:40 a.m., 4:52 p.m.
9555 St. Marys/Chicago - 7:00 a.m., 4:38 p.m.
4350 Terry - 7:10 a.m., 4:25 p.m.
10500 Lyndon/Butzel Recreation - 7:20 a.m., 4:20 p.m.
3729 W. Chicago/Salvation Army - 7:32 a.m.,	4:10 p.m.
14140 Woodward/CVS – HP - 7:45 a.m., 3:57 p.m.
1000 Mack/McDonald’s - 8:15 a.m., 3:47 p.m.
7375 Woodward – Youthville - 6:40 a.m., 5:15 p.m.
7140 E. 7 Mile – Library - 7:00 a.m., 5:00 p.m.
Brock/Manning/Heilman - 7:14 a.m., 4:46 p.m.
13651 E. McNichols - Library - 7:20 a.m., 4:40 p.m.
5201 Alter Road/Corrigan - 7:36 a.m., 4:29 p.m.
11950 E. Warren/Conner - 7:42 a.m., 4:23 p.m.
4743 Iroquois/Forest - 7:49 a.m., 4:15 p.m.
700 Chene/Lafayette - 8:07 a.m., 3:55 p.m. There is currently a waiting list for bus transportation. Parents can complete a request form and will be contacted as spaces become available. 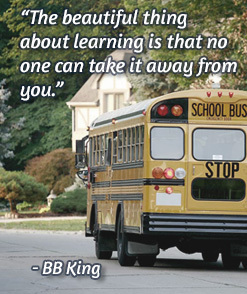 Our school bus drivers possess a commercial driver’s license and pass the state bus driver certification. We’re proud of our safety record and the years of service it has provided the Plymouth Educational Center.